What is the difference between this product and their original grab-n-go drinkable yogurts? 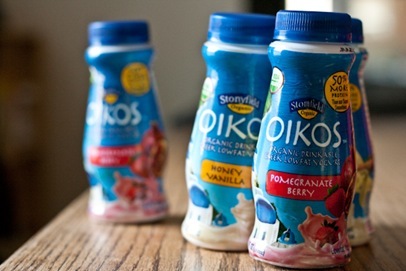 These use the Oikos, organic Greek yogurt, which gives them 50% more protein. So what did I think of these? I would consider these a snack option, or something to go along with a medium size bowl of oats, or maybe toast and nut butter for breakfast. The protein content is definitely higher, in comparison to other quick snack options, like a Larabar, KIND Bar, etc. The texture was smooth, and not too thick. Very “drinkable.” If you’re not a fan of plain Greek yogurt because of the tartness, these are much sweeter, so you might enjoy them. What I don’t like about these? The sugar content. I know some of it comes from the natural sugars in the fruit and the milk, but in comparison to a container of Greek yogurt, these have about 10g more sugar and about 4g less protein. While I enjoyed both flavors, they were overly sweet for my taste buds. If you’re looking for a snack that doesn’t require a spoon, this may work for you, but I think I’ll stick to the spoonable Oikos yogurt instead. 2. As mentioned recently, Swanson Health Products, gave me $25 to spend at their online store. Instead of choosing from the vitamins + supplements, I went straight to the food section of the website. I wanted to buy things I typically would not purchase at the store because of the price tag. 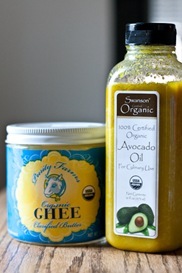 I ended up with a large tub of organic Ghee [13oz - $7.96] and organic Avocado Oil [16oz - $14.99]. Both were at great prices, but still out of my typical grocery budget. I haven’t used the avocado oil too much, but so far have enjoyed it on salads, with apple cider vinegar and balsamic. I refrigerated it, as suggested, but it soon turned into a thick, non pourable paste. I’m not sure what happened!? I’ll continue to use it but probably only as a cooking oil. The great thing about avocado oil, which you might not suspect, is that it is a great high heat cooking oil. The ghee is…amazing. It’s like extra rich butter, if you can even imagine such a thing. I’ve been using it in recipes non-stop lately! Have you ever used either of these fats? 3. My workouts. Continued from Monday’s post. These were your suggestions, other than Body Rock. After briefly researching each one, here are my thoughts. $120 for the equipment + DVD’s – This definitely seems like something that would work really well and is low impact. However, I’m not sure I could commit to 60min videos each day. I don’t mind a workout that long [or longer] but can’t really get into videos. While $120 is definitely not cheap, it at least comes with everything you need. I do like the idea of the resistance, rip cord training. No mess of home weights to deal with. $120 + $25s/h – This workout looks intense, in a good way, but a little too high impact. It comes with only the DVD workouts, but it doesn’t look like you need any equipment. And again with the long videos. Not sure I’m ready to workout in front of the TV every single day. A great low impact option, and you’re able to purchase each DVD separately [about $23/ea], to get the exact workouts you want. This looks a bit less appealing to me, even though it’s a low impact series. I really am looking for those short, effective workouts, like Body Rock offers. “constantly varied, high-intensity, functional movement” This one was the hardest to understand. It looks like an intense, heavy lifting program. It’s recommended you do this with trained CrossFit professionals, at a local affiliate. I’m assuming this is quite expensive, and it’s not exactly what I’m looking for. Developed by Lindsay, of Lindsay’s List, a virtual fitness class that Lindsay has put together and posts to each Tuesday. Each week a different workout theme is covered. A great source! Again with the hour long DVD workouts. These workouts consist of isometric exercises, using your own bodyweight. You get a mix of strength training and cardio with an all in one, low impact workout. I’m not sure that any of these workouts are the right fit for me, so my search continues. Time to go bug Janetha, Gina, Michelle + Lori for more ideas! 4. Many of you had questions about the Body Rock workouts I was doing and if I bought the equipment that goes along with a lot of the workouts. I didn’t buy any equipment and stuck to the workouts that didn’t require the sandbags, pull up/dip bars, etc.. I did download an interval timer app on my iPhone, which was really helpful. Considering I repeated only a handful of the workouts, I’m amazed that I got such great results. I can’t even imagine incorporating in the workouts that do require the equipment! I stuck to this Tone, Trim and Tight workout and the 4 others mentioned in that post. I typically did Body Rock workouts 3 days per week. I’m not ruling Body Rock out at this point. My foot feels 100% better right now, but I’m still a little worried to move full blown back into BR. I’m going to check out some of the BR workouts that do require equipment, because I think those won’t be nearly as high-impact. I’ve also seen a lot of people construct the dip station at home and the Michelle + Lori have a great tutorial on making the sandbags with an empty duffle bag and bagged rice. The great thing about BR, is that the workouts are FREE and they typically range from 10-25min. You aren’t really following a fitness video either. The workout is explained and then there is a video that goes over each + every move. Once you get the moves down, there’s no need to watch the instructional. I never became bored with these workouts, because they were over before I knew it and still left me with time to do light cardio, like walking the dogs or cycling. While they are free, some equipment is needed, if you’re going to go all out with these workouts. 5. La la laaaaaa could this post be any longer? 6. Yes! Still going! Time for some link love. Have you seen the website The Greatist? Talk about an awesome source for health + fitness. The site is easy to navigate and simply designed. Organized websites are hard to find! One thing I’m loving, is their A-Z Guide. You search for topics by letter, which is very useful. Have I ever told you about my love for the website Tree Hugger? I’ve been obsessed for years. Raw Cocoa Buckwheat Granola??? Awesome recipe Gena! Baklava with a vanilla bean twist. Give.me.this.now. Would you stay at the Tree Hotel in Sweden? Sign me up! 7. Okay. I’ll leave now!